To experience Thinglink, roll your mouse over the Apollo 11 collage I created below to see where the hot spots are, then click on any of them to enjoy the multimedia. Go to the Thinglinwebsite and sign up for a free account. Follow the directions on the site to install the widget on your blog or wiki. 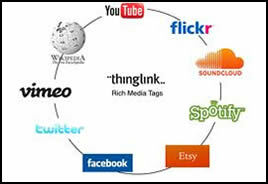 Upload an image to Thinglink..
Click on the paper clip icon in the upper left corner to Edit Tags. Drag your mouse across an image. You should see the crosshair tool, or plus sign. You will be prompted to add a link to a website or video OR click the orange button to record with SoundCloud. A free SoundCloud account is required. Click on the Embed Image icon in the upper left corner. Paste the code into your blog or a wiki widget. Post an historical photo and use 3rd party software, such as SoundCloud, to give students the opportunity to record their voices speaking from the person’s point of view. Use a Thinglinked image to create a scavenger hunt or modified WebQuest. Of course, the possibilities are tremendous here. These are just some ideas to get you started. *Go to my wiki to view my favorite copyright-friendly images sources for students and teachers. Inspired by Kathy Schrock’s Bloomin’ iPad, I decided to use Scoop.it to create a collection of visual resources to support Bloom’s Revised Taxonomy. View the collection on Scoop.it. Scoop.it is a curation service that allows users to collect information about a topic of interest and display it all on one attractive visual page. The tool integrates instantly with Twitter and Facebook, allowing you to share with the click of a button, and a newly added feature allows users to embed a preview of your Scoop.it page into any blog, wiki or website. See the Cool Tools for Drawing sample I created below.. Besides for it’s attractive and visual format, one of the biggest differences between Scoop.it and a traditional blog is that the creator can choose to simply collect and display content without having to write about it. Of course, users can add a post of your own too, but if you’d prefer to simply share, Scoop.it will do the trick. Scoop.it is a user friendly tool. Simply install the handy bookmarklet in your toolbar and collect information yourself, or use the suggested resources collected for you based on the keywords you submit when you crete your page. Scoop.it will find images and descriptions of the pages you choose to display, or you can add your own with a few more clicks. The most important thing to remember when using this tool is to keep it simple and stick to one topic. Collect resources at a variety of reading levels on a particular topic or area of study. Collect news resources from different countries and/or perspectives to expose students to a current event or issue from a global perspective. Create a page of related resources using a variety of multimedia to provide students with multiple ways to access information. Collect and display primary source documents all in one place to help students bring it all together. 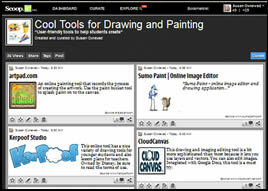 Create a page of student-created projects for sharing on the web. Tag Galaxy is a Cool Tool to visually explore word relationships. Just type in a term and watch a 3D orbiting galaxy of words and their associations evolve Click on any word to move it to the center of the galaxy, then click on it again and watch the globe populate with tagged images from Flickr. Project Tag Galaxy on a wall to help students visualize vocabulary words, ideas and concepts. 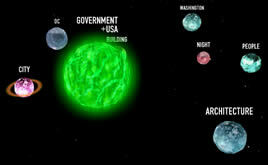 Display Tag Galaxy on an interactive white board and let students touch the globe and explore. Use the photos to prompt creative writing. Engage students in a guided visual search. I’ve always been interested in new ways to view and think about Bloom’s Taxonomy and the folks at Learning Today have created a poster worth sharing. 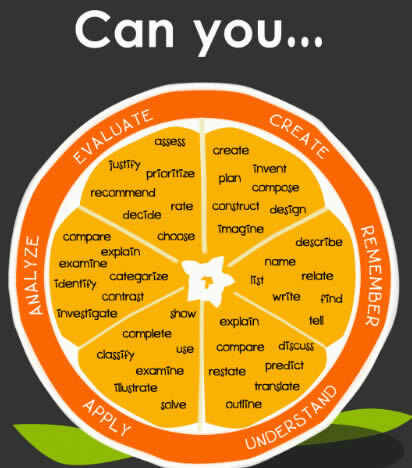 To help teachers get thinking about ways to apply Bloom’s higher-order thinking skills in the classroom, they’ve put a spin on the traditional hierarchy and limited the number of verbs in each section to create The Blooming Orange. They’ve popped Bloom’s verbage into the segments of an orange and intentionally depicted it as a circle to illustrate the fact that often these skills do not occur in isolation, they often occur simultaneously. This Blooming Orange presents itself as a teacher-friendly tool for planning and possibly an easier way for everyone to think about Bloom’s. Be sure to click on the link below to visit the Learning Today blog and print a copy of this poster to hang in your classroom. Present.Me is a free tool that allows you to use the webcam and microphone on your computer to record yourself giving a PowerPoint presentation. Just create and upload your presentation, then use your computer’s webcam to talk about it as you progress through the slides. The end result is a side-by-side view of the presentation along with the presenter. The entire creation is stored online and easily accessed through a link. My first thought is this would be a great way for teachers to try The Flipped Classroom approach to teaching by publishing a Present.Me and asking students to view and interact with the content for homework in preparation for the next class. 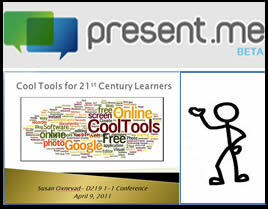 After all, many teachers are already familiar with PowerPoint and recording yourself with this tool is quite easy. Another good use of this tool might be to have students use it as a substitute for the traditional whole-class project presentation. Instead of asking the student audience to sit through hours of student-led presentations, assign them a task related to viewing the presentations and let them interact with them at their own pace. Teachers can use this tool to create and publish presentations online for parents unable to attend Open House/Curriculum Night that generally happens at the start of the year. Schools and districts might consider using this tool to make good use of limited staff development time by creating and publishing an ongoing list of resources. Provide teachers with time to view and interact with presentations during staff meeting time, and also give them the opportunity to continue the learning at home. And of course, this tool could be really useful for virtual conferences of all kinds. I spent the first part of my summer working with teachers to help them learn to use technology as a tool for differentiating reading instruction to help all learners succeed. During that time we experimented with many different tools for teaching vocabulary. Here is a glance at the list of tools the course participants found to be user-friendly and useful for students and teachers. A very nice multi-lingual visual dictionary that creates a word web and defines words based on parts of speech. Use the toolbar bookmarklet for convenience. An amazing tool that turns all the words in any website or digital text into a clickable dictionary and translates text into 12 different languages. A visual dictionary that combines Wiktionary content with Flickr images, and more. An online interactive English dictionary and thesaurus that helps you find the meanings of words and draw connections to associated words. Look up words to find their meanings and associations with other words and concepts. This tool uses photographs of words in the real world to visually explore them. A very popular site for vocabulary games. Copy and paste text into the box and this tool generates a word cloud to identify the key vocabulary. Sort words by content area. Place text into a box and then press sift to create a word cloud in which most frequently used words appear larger in size. A tool that uses video to make personal connections for users. The school account keeps it safe for students and allows students to create their own video definitions and schools to build their own dictionaries. Use this word cloud generator to identify key vocabulary in digital text. Try copying and pasting more than one related article into Wordle to get the big picture. Teachers can sign up for a free account and create word lists to support written text. With a click of a button, students can access dictionary information and create flash cards for review. This tool creates a 3D orbiting galaxy of words and their associations Click on any word to move it to the center of the galaxy, then click again and watch the globe populate with images from Flicker. This is a must see. 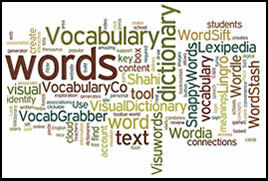 WordStash is a dictionary based website for helping students learn vocabulary and more. Teachers can sign up for a free account to create and store word lists to support written text. With the click of a button, users can access definitions, example sentences from context and pictures to support the word. Once created, teachers will have a set of digital flash cards to use to help students practice the words and concepts through a couple of no-nonsense games and quizzes. 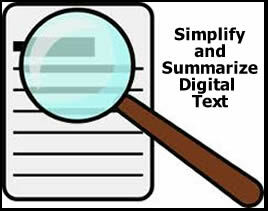 Students can access the vocabulary activities through a link, without logging in. At first glance, this seems like a handy tool for reviewing vocabulary, but after experimenting with the tool myself, I realized that the tool can also be used to help students build their own knowledge about vocabulary terms and concepts, which makes it a much more appealing tool. At it’s most basic level, users can create a word card in a few quick and simple steps. Choose the appropriate part of speech from a list. Click on the appropriate definition to add it to the card. Add an image from the Flicker or Wikipedia database. Following those steps will yield word cards like the example below. Read the given definitions, then search for an article on the Internet that uses the word in context. Word stash has a button to find context clues, but I found it easier to do my own search. From the context, develop your own definition of the word. Type that definition on the word card..
Add a more accurate image from the database by typing in a more manually adjusting the search term. 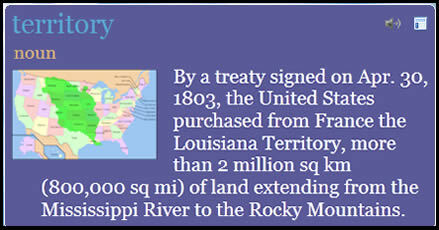 In this case, the term “territory” yielded a generic image, but type in “Louisiana Purchase” did the trick. Truly, by building my own specific vocabulary card I also developed my own understanding of the word as it was related to the content and I think this could be a very meaningful activity for students. Sign up for a free teacher account and try WordStash for yourself.